In today's cordless drill/driver market, we can have many options to choose from, but not all power tools can combine the features that you are looking for. 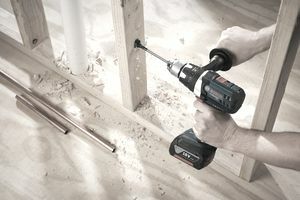 I was able to spend some time playing and working with the Bosch DDH181X-01 Drill/Driver and I can tell it is a very solid power tool that you need to have in your toolbox. The Bosch cordless drill/driver was used in different situations and I was extremely pleased with its performance. Let's go over some details of the product and then I will summarize my experience with the cordless power tool. What Does the Bosch DDH181X-01 Features? The 1/2 inch drill/driver 18 Volt cordless power tool comes with a led light, auxiliary handle, and two-speed transmission. One of the most important features of the tool is the active response technology and a maximum power of 700 in-lbs of torque backed up by an open frame motor. It also offers 25 clutch settings and a variable-speed trigger. Bosch offers a 3-year limited warranty to its reversible cordless 18V power tool. The power tool comes inside a very elegant and useful carrying case, helping you in keeping all the accessories handy. Once open and making sure all included accessories, were in good shape, we decided to install the auxiliary handle. The rubber handle can be easily adjusted and has the ability to be rotated almost at a 360 degree, but with the exception of where the battery pack is installed. The rubber handle offers the anti-slip grip needed when using the tool. Attached to the handle, you can find the depth gauge that is used to control the drilling depth. The drill was tested using 1/4", 3/8" and 1/2" drill bits on a housing frame. I drilled several holes through the 2" x 4" and all holes were smooth and straight through the stud. The drill was used at two different speeds using pilot holes as recommended by the manufacturer. I also tested dropping the drill from about 5 feet high (Bosch indicates that can withstand 10-foot drops), and no major scratches were seen after the drill was picked up from the floor. At full speed, the handle comes in very handy to manage the extra torque applied by the cordless tool. One great thing is that the drill has a very clever LED light at the base of the tool, that will be illuminating the working area. As for the batteries, one extra pack is always good, so Bosch already took care of that providing one additional battery with the tool. I was able to operate the drill continuously without losing power as the battery drained out. The battery can be fully charged in about 25 minutes and the drill maintains the battery cool when in use, preventing it from overheating. What Do I Like the Most of the Bosch DDH181X-01 Drill/Driver? Other than how fast batteries can be charged and how tough the tool is, the safety feature called Active Response Technology is a plus and the feature that I like the most Bosch has come up with an excellent safety technology that will reduce the number of broken wrists that occur when a drill bit binds up. This tool will shut up the motor (actual sensors will detect the sudden torque change) to prevent you from twisting the wrist, making it a must-have drill for your toolbox. Two thumbs up for Bosch! The Bosch DDH181X-01 Drill/Driver is a great tool that combines toughness, speed, technology and safety under one single power tool. Great buy and superb product.